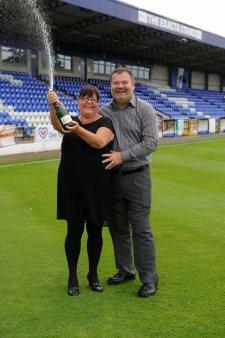 Neston residents John and Carol Reddy are celebrating today after scooping more than £400,000 on EuroMillions. The couple matched five numbers, 4, 5, 17, 38 and 48 plus the lucky star, 3, in the August 21st draw, banking them £445,440.80. They say their win will now enable them to fulfil one of their dreams – to have their marriage of 20 years re-blessed in Spain and for their daughter, Naomi, 12, to be their bridesmaid. Carol, 47, a receptionist in the accident and emergency department at the Countess of Chester Hospital, said: “We have been married for 20 years this year and have always wanted to have our marriage blessed abroad. The win could not have come at a better time for them, as on the day they discovered they had won they had been due to visit John’s parents to borrow some money to enable them to finish refurbishing their family home. John, 47, a self-employed purchasing consultant, said: “We had been decorating the house and had almost finished but desperately needed a new garage door as the existing one just looked totally out of place with all of the work which we had been doing. “There was no way we were going to be able to afford a new door at the moment and we had already borrowed money from Carol’s parents to help pay for a holiday. The couple, who also have a 17-year-old son, Ben, say they have started to make a wish list – top of it is a Mercedes SLK convertible for John and a leather “wag bag” for Carol. A family holiday is also on the cards, together with a trip to a National Basketball Association game as Ben is a keen basketball player and Captains the Cheshire Jets’ junior team. John, who was born and bred in Chester and has been a Chester City fan since the age of eight, is also planning on buying a season ticket and says he will buy one for his brother, Tony, too. John added that he would also like to sponsor a game in memory of his brother in law, Kevin, who died in July at the age of 45 after suffering with cancer. John plays EuroMillions online every Tuesday and Friday. He has previously won several small amounts of money and said when he initially received the email to tell him he had won this week he thought it was another £2.00. And John said it still hasn’t sunk in: “I still cannot believe it is really me who has won. I have to keep pinching myself to make me believe that this has really happened. The couple have said they both intend to continue working and will definitely be continuing to play the lottery.